“Fire! Fire! Fire!” with our exchange operator screaming at the top of his voice; woke me up from deep slumber. Our regiment was located in the higher reaches of Sikkim on 12 December 1997 when this incident occurred. The area was covered with about four feet of frozen solid snow with the temperature touching minus 20 degrees Celsius. I paid a visit to the dentist in the evening as my wisdom tooth was troubling me and I was under immense pain. The dentist decided that the best way out was extraction and hence administered local anesthesia on my gums and did the extraction. He advised me to take rest for a day or two. I reached my room and I had a splitting headache as a result of the anesthesia. I decided to go to sleep and hit the bed. At dusk, our Commanding Officer (CO) Colonel PK Ramachandran, wanted to talk to me and called up the Regimental Telephone Exchange to connect the call. The exchange operator had tried the call many times but as I was in deep slumber, I did not answer the call. The exchange operator came to my room and saw me in deep slumber and informed the CO about my status. Our CO being a thorough gentleman, advised the operator to let me enjoy my sleep and to put through the call the moment I woke up. At about 9 PM, the exchange operator noticed smoke and flames in the building I was sleeping. He came rushing into my room screaming and woke me up. He said that my room was on fire. By that time about five soldiers also came in. I ordered everyone to clear off and not get any burn injuries. The soldiers led by the exchange operator were salvaging my desktop PC, the TV and the VCR. I stepped out of the room engulfed in flames wearing my sandals. Luckily my Identity Card was safe as it was in my uniform shirt’s pocket as I had slept off without changing my uniform. The fire started because the officer staying in the neighbouring room had forgotten to turn off his kerosene based room heating system. As I stood outside in the biting cold, I could see the entire building up in flames. The soldiers were in the act of salvaging everything from the adjacent buildings. That was when we realised that the water tankers in the regiment were empty as the orders were to keep the tankers empty to prevent them from freezing. The solid frozen snow was of no use to douse the fire as it could not be lifted off the ground. The order was passed immediately that all water tankers will be kept three-fourth full every night to meet such eventualities. Our CO came to me and asked as to how I felt and I replied that the only thing I could do was to enjoy the warmth the fire was providing on a freezing night. Next morning the soldiers scouted through the ashes and Subedar (Warrant Officer) Balakishan came out with all my medals (given by the government in recognition of bravery, honour and sacrifice) and a photograph which was intact despite the raging fire. It was our marriage photograph dated 16 April 1989. I immediately said that “What God has united no raging fire, storm or hail can ever separate”. An Orthodox Syrian Christian wedding follows similar procedures as done by other Orthodox faiths like Greek, Slavic, and Egyptian. It begins with the Betrothal service where the Priest blesses the rings of the Bride and Groom, then places them on the ring fingers of their right hands. In the Bible, the right hand is the preferred hand, indicating good. The Betrothal dramatizes the free decision made by the Bride and Groom, and is symbolized by the giving of rings. The Marriage Ceremony begins immediately thereafter culminating in the crowning. It begins with the priest placing a crown on the groom’s head while reciting the crown blessing thrice. Then the crowning ceremony of the bride follows in the similar way. The Greek and Slavic Orthodox use crowns made from olive leaves and the Syrian Orthodox use a gold chain as a symbolic crown. The crowning is a sign of victory, just as athletes were crowned in ancient times at their triumphs. In this instance, the Bride and Groom are crowned on account of their growth as mature Christians, prepared for the responsibilities of a Christian marriage. This is followed by a series of petitions and prayers with special reference to well known couples of the Old Testament, such as Abraham and Sarah. An epistle excerpt of Saint Paul is read, exhorting husband and wife to unconditional love and support of one another. Then an excerpt from the Gospel of Saint John is read, relating to the wedding at Cana when Christ performed the first of His miracles and blessed the institution of marriage. The differences in the marriage ceremony between other Orthodox faiths and Kerala’s Syrian Orthodox faith begin here. 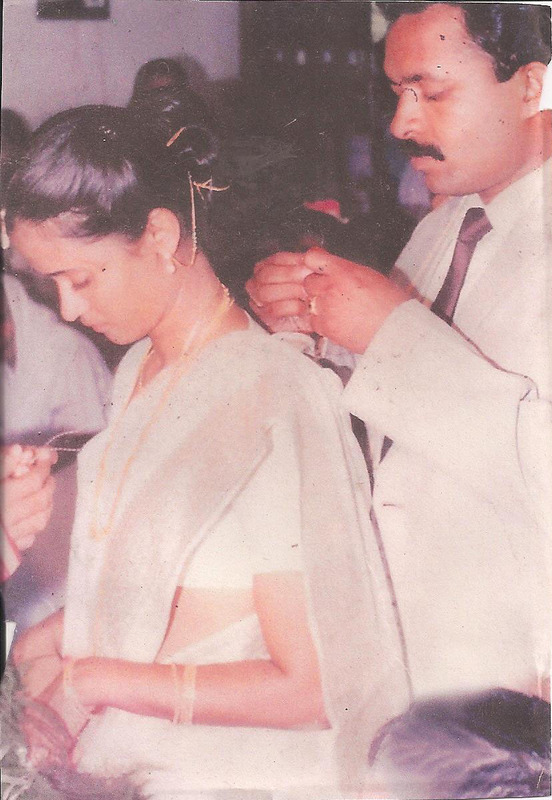 The groom ties the ‘Minnu’ around the bride’s neck – tying the knot. This has been adopted from the Hindu traditions. the ‘Thali’ used in a Kerala Hindu marriage was in the shape of a leaf of the sacred banyan tree and Christians modified the Thali by superimposing a cross on the leaf and called it a ‘Minnu’. The Minnu is suspended on seven threads drawn out of the Manthradoki. The seven strands represent the bride, the bridegroom, the couple’s parents and the Church. The groom then places the ‘Manthrakodi’, a sari presented by the bridegroom and his family, which is draped over the bride’s head, symbolizing the groom’s pledge to protect, care for and cherish his wife The Manthrakodi is the adaptation from the earlier Kerala Hindu Nair traditions of ‘Pudavakoda’ where the marriage was a contract and handing over clothes for the bride indicated entry into a contracted marriage. At this point, the bride’s relative, who has been standing behind her, yields her place to a female member of the groom’s family as a sign that the bride is welcomed into her new family. The ceremony ends with a benediction and prayer. The Priest uses the Bible to uncouple the hands of the Bride and Groom signifying that only God can come between them. It is always the priest who will preside over the actual marriage ceremony that is the tying of the Minnu. If a bishop is present, he will only bless the Minnu. This tradition may have emerged from the old Travancore Christian Marriage Acts wherein only the priest had the magisterial power to conduct a marriage. Even though our marriage was not conducted in the presence of Fire God (Agni), our wedding photograph lived through an Agni Pareeksha (Trial by Fire). As per the act any Clergy can conduct the marriage. When the Bishops from Antioica arrived in Kerala, they are not aware of the Minnukettu function & they asked the local priest to conduct this function. Subsequently the Bishops take it as a custom procedure & always ask the priest to oversee this function. For any marriage only a priest is required but just for show off people are calling Bishops and a dozen priests to stand around the couple. They ensure their faces in all wedding photos & the poor relatives can be seen in any of the wedding photos. That was a nice one ! that was a close shave Reji ! marriages r made in heaven. ur then CO the cool P K is my course mate, a spl one as we travelled together to join I M A in Jan 1976. Few old tradtions of christian marriages had undergone few changes in past but are regaining its importance and coming back. The “madram veppu” on previous night is back but assembly of huge number of relatives at grooms/ brides home, making temporary “panthal”in the courtyard etc are only things of the past. As a child I had seen all these preparations with tremendous amount of curiosity. Reji sir, u r indeed lucky to salvage the wedding photograph as such things were not digitalised or copied in DVDs when the fire took place.. Lucky u both!! !